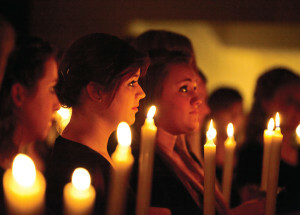 The Christmas tradition of the John Brown University Candlelight Service will be held on Thursday, Friday and Saturday, Dec. 12-14 in the Cathedral of the Ozarks. The annual event rings in the Christmas season with traditional melodies, Christmas classics and inspirational readings. This year’s Candlelight Service will feature selections performed by the Cathedral Choir and Chamber Choir, directed by Paul Smith, the Women’s Chorus, directed by Kate Dewey and the Chamber Orchestra, directed by Terri Wubbena. The celebration will also feature a choral introit fanfare with four trumpets, along with a special double trio men’s ensemble as well as a small women’s ensemble performing a Romanian Carol. Harpist Joyce Timmons will again be featured in a special performance with the Women’s Chorus. The Candlelight Service has been a tradition at JBU since the 1940’s. From its beginning the event has welcomed countless people in Northwest Arkansas, the surrounding states and the JBU community to celebrate the Christmas season. All performances are free and open to the public. Doors will open for general seating at 6:30 p.m., and the service will begin promptly at 7 p.m. Seating is on a first come, first served basis and early arrival is encouraged. To preserve the worshipful atmosphere of the Candlelight Services, guests are respectfully requested to consider not bringing young children and to refrain from flash photography.